With 7 weeks until the Melbourne Marathon festival, training should be heading towards its peak. As a result, we have compiled 8 important tips to help you consolidate the most important stage of your training. You need to make sure you are doing everything possible to be recovering from those long runs. Beach sessions, ice baths, stretching, soft tissue massage, foam rolling, replenishing energy stocks/electrolytes/fluid. Make sure you get any of those niggles dealt with NOW! Those niggles are only become more of an issue in the next 2months. As hard as it is to complete those tretarious runs, the long runs on the weekend (or other days) are the key. Your almost there, and be sure to get those long runs on the weekend to get yourself best prepared. 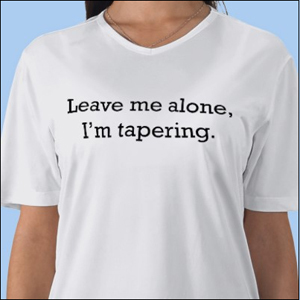 You need to make sure that you have atleast 2weeks (ideally 4 weeks) of tapering before raceday. Whether its the 5km run or marathon, you can't be at a "peak" of your training heading into the run. Your body needs a chance to recover and consolidate the training regime. That doesn't mean complete rest heading into the run, but you should have done your longest run by 2-4weeks prior to the run. You will gain nothing more so close to the run, apart from just burning out. If you are going to use fluid or energy supplements during your run, you need to be testing them out NOW! Everyone responds differently to energy options and you don't want to use them for the first time on raceday and gastrointestinal issues etc. Options include (and not limited to): Flat coke, energy gel bars, lollies, powerade, chocolate bars. Normal rule of thumb is that you should be using some sort of fluid and electrolyte rehydration mid race after 60mins (and thereafter at periodic times that you have tested). You don't want to go into a new pair of shoes on raceday. Make sure you have done a few long runs in a new pair of shoes at least 3-4 times. If you havent, you are setting yourself up for blisters and other unnecessary foot and toe issues. Remember, shoes last around 500-800kms, so you dont also want to be running in a pair of shoes that have done their time. So, maybe look at getting a new set of shoes pretty soon if you require them! Running in a event like this is very exciting. There is a lot of buzz and excitement at the start line. You must make sure that you don't "get sucked in". Soak it up but be careful not to go out too hard initially. Start at your normal pace that you have been training at, and if you are still feeling good into the race, then step it up. It is very very easy to go out too hard to early and burning out well before the finish plan. Have a race plan and stick to it and then you can re-assess how your feeling later in the run and readjust your pace accordingly. Most importantly, enjoy the day and soak up the great atmosphere! Whether its the 5km, 10km, half or full marathon its a tremendous achievement to train for a event and finish it. We wish all our patients best of luck!